“Dry-in” is when the outside of your house is done. 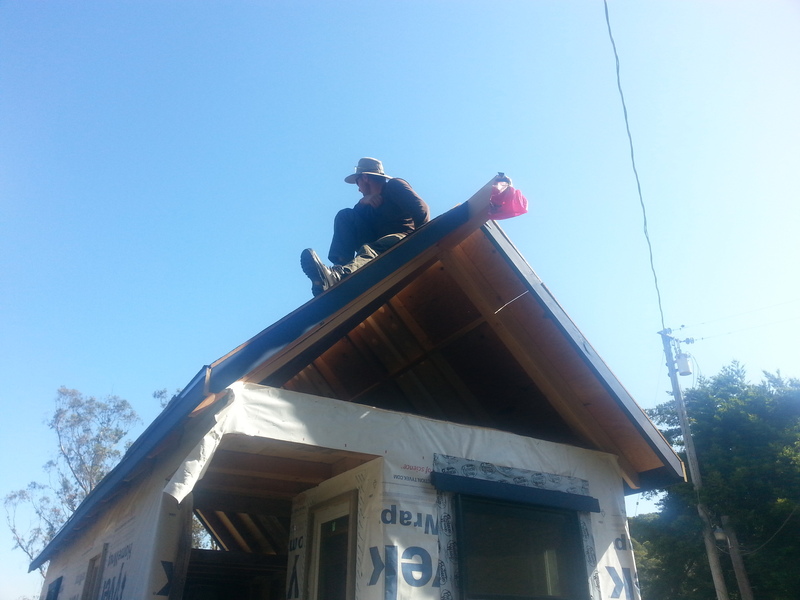 Windows and doors are in, roof is on, siding is up, caulking has happened… and more. We are almost there. At the end of July we will be moving off of the beautiful sheep ranch that has been our home for the last year-plus, and we are determined to have our house all closed-up, and ready to withstand journeys and weather, by then. Perhaps this watering trough would work as a bathtub… or maybe we don’t want a bathtub. Gotta make that decision before we put the front door on or we might not be able to get our choice into the house! We found this robin’s nest in the grille of our big yellow truck! Our friend Mark made beautiful bird’s mouth cuts on each of the rafters. House, I want to hug you! GORGEOUS! (Also, always say yes to a bathtub. Seriously. Or else move near a hot springs.) The bird’s nest seems like a good auspice. The house looks amazing. Just last November, I became aware of what you were doing out on the sheep ranch, and look at your now! All of the best as you move into the next phase of life without sheep, and with every possibility imaginable. I love the “House, I want to hug you!” pic! Perfect! Tiny House looks amazing. Almost there! We moved into our giant (compared to yours) house in Ecuador when it was basically Dry-in and spent the next 9 years finishing the inside, with us living in it. Great work guys! Good luck with the move. Thank you! I love that pic too 🙂 Yes, I saw that house of yours just before you moved in! How did you deal with living in it while building it? Any thoughts or tips? Just imagine you are camping in luxury (stove, toilet, and maybe, if you’re lucky, a warm shower). Lots of love! Nice! Lots of love to you! Good work. 2 or years ago joe and i and matt sherman shared a dusty few days tearing off an old slate roof 3 stories up. Joseph must have learned something. At the least that standing on your ridge beam and singing like a rooster is as good as rock and roll. That great lil house your building is both humble and a stand alone special space. I am sure it will hold you well. Contain but not constrain. It IS as good as Rock and Roll. I learned a lot from you on the jobs we worked together and have thought of you and Matthew often while building this abode of ours. Thank you for your kind words of support. Contain but not constrain. I love it.